The Sharma household at Chaina village in Faridkot is buzzing with activity. Charanjeet Kaur is busy ensuring that she does not run out of gram flour, jaggery, green chillies, garlic and neem leaves. No she is not preparing for a lavish lunch. This is a "magic potion" for her two-hectare (ha) farm. Magic potion? For two years, the Sharmas have been sprinkling a concoction of these ingredients over their crops to keep away pests (See box Homemade pesticides). That's zero-budget natural farming for you or 'spiritual farming' as Amravati-based environmentalist Subhash Palekar calls it. 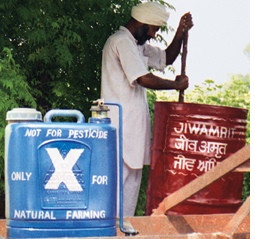 Over six years, farmers in Punjab--mostly in Faridkot, Bathinda and Ferozepur districts--have been waking up to the benefits of natural farming, which shuns the use of chemicals and does not require buying seeds, fertilizers and pesticides from the market.Instead, homemade potions keep the soil pest-free; practices like mixed cropping and mulching, or covering the soil, help maintain its nutrient balance and bring down water consumption by 40 per cent. Punjab, the biggest user of pesticides and fertilizers in the country, needs that healing touch. Its farms are ecologically degraded, raising the cost of farming. "Farmers' suicides were quite high in the past two decades. Farmers were getting trapped in debt, so we evolved this zero-budget farming. No institutional credit is needed and dependence on hired labour is reduced to a minimum," explains Palekar, who has worked on natural farming for 12 years. According to a 2004 survey by the Punjab government, 2,116 farmers in the state had committed suicide in the previous 15 years. The Bhartiya Kisan Union claims that 13,000 farmers committed suicide between 2000 and 2005 in Punjab. A 2005 survey on 'Indebtedness of Farmer Households' done by the National Sample Survey Organisation, also found that the farmers in Punjab were the most heavily indebted in the country. Debt per household was Rs 41,576. Even organic farming being promoted in the state by the Organic Farmers Council requiring substantial investment did not promise recovery from debt. In these circumstances the concept of zero-budget is attractive. Charanjeet's husband Amarjeet Sharma says venturing into natural farming was "the best move we made". Today his farm has agro-ecological diversity. Besides cotton, wheat and paddy, he has begun growing fruits, vegetables and sugarcane. Vegetables alone fetched him Rs 8,000 this year. Birds and butterflies, absent or scant elsewhere, are in abundance here. Not far away in Bathinda's Raika Kalan village, Harjant Singh brought 15 ha under natural farming six years ago. His farm boasts cotton, legumes, sugarcane and vegetables. "The quality of my soil has improved since," he says. Although economists and agricultural scientists argue that natural fertilizers cannot replace chemical fertilizers, it is working for the 1,214 ha under natural farming in Punjab, claims the Kheti Virasat Mission, which is working with Palekar to promote natural farming in the state. And unlike organic farming, natural farming does not use artificially synthesized microbial culture like vermicomposting. Instead it promotes a fermented mix of cow dung and cow urine. Microorganisms developed during fermentation attract earthworms which work on the soil, leaving it puffy, soft and aerated. Palekar says that cow dung has all the microbes which the costly vermicomposting can provide. " Gobar and gomutra of indigenous breeds of cow like sahiwal, tharparkar and rathi give the best results in natural farming," says Amarjit Singh Dhillon, a farmer in Dabari Khana village in Faridkot. One gramme of the dung of a desi cow contains 3,000 million bacteria against 5-6 million bacteria in one gramme of an American cow's dung, says Umendra Dutt, the executive director of the Kheti Virasat Mission. Dutt says the mix prepared in natural farming attracts the earthworms most suited to Indian soils. These earthworms, he adds, bring nutrients from the deeper layers of the earth. There is another benefit of using cow dung repulsed by its smell, nilgais and rabbits do not invade crops, claims Dutt. Under natural farming, farmers use a lot of other techniques to maintain soil fertility and reduce tilling. One of them, mulching with organic residues like leaves and plants reduces tilling, suppresses weed growth, promotes humus formation and enhances the water-holding capacity of the soil, equipping it for drought-like conditions. Palekar also recommends mixed or multi-cropping. Planting leguminous crops helps replenish soil fertility while providing a buffer against total crop failure.Sowing cowpea and other pulses along with companion crops like sorghum and millet (used as cattle fodder) has become a regular practice. Farmers are experimenting with a variety of crops. As Pritpal Singh Brar of Faridkot's Chaina village explains, they had grown ajwain (Bishop's weed), fennel, fenugreek and coriander alongside wheat last year. Harjant Singh ensures he grows maize with cotton since "it attracts birds which will feed on the pests attacking the cotton crop." Amarjeet Sharma had grown vegetables on the same farm in which he grew cotton. The farmers are also using Indian varieties and claim better results. For wheat, most farmers are shifting to the indigenous bansi (Maharashtra), mundari (Uttaranchal) and C-206 (Rajasthan) varieties. For cotton they use narma seeds. Unlike in chemical farming where seeds last a season, these seeds are preserved for the next season. They are setting up their own seed banks. When natural farming was being promoted in Punjab, many farmers did not buy the idea initially. But negligible input costs and better quality yields are now making them change their opinion. 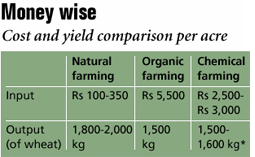 In fact, these became the crucial reason many switched from organic to natural farming (See table Money wise).Amarjeet's neighbour Charanjit Singh Punni was one of them. "I wasn't satisfied with organic farming and was suffering huge losses. It was becoming costlier than chemical farming," he says. Last year, Punni converted only about a hectare of his land to natural farming. With an increased yield this year, he plans to practise natural farming on his remaining 7 ha. While V S Chimni, ceo of the Organic Farmers Council in Punjab, claims that after an initial dip, yields surpass that of chemical farming in the third year, farmers often find organic farming an expensive proposition. "Organic farming depends on inputs promoted by multinationals. Companies, including Amway, Hindustan Lever Limited and Reliance are promoting their products as organic or herbal," says Dutt. He, however, admits that there is a thin line between organic and natural farming. "We are not against organic farming but against corporate-controlled farming. Certification of the farm, the inputs and the produce makes it a costly affair. It will leave the farmers dependent on the government which is not the case in natural farming," he adds. The Organic Farmers Council, which has brought over 2,000 ha in Punjab under organic farming, however, says certified organic products get a premium of 30-40 per cent in the market. The Kheti Virasat Mission is also working on a marketing strategy for naturally farmed produce. It plans to set up a weekly green market and formulate a participatory guarantee scheme called Kudrati Ahar Parivaar, which will have the consumers and producers as members. Even before such a system is put in place, Punni managed to sell his naturally grown wheat at Rs 20 per kg this year, while the bansi variety fetched him Rs 30 per kg against the government rate of Rs 8.5. Reason enough to go green with envy.